Iblue Brand is a Trade Mark Registered in The US. IBLUE GENUINE LEATHER WEEKEND BAG #B002: Classical and Vintage Design, Multiple Uses, Quality Material , Excellent Price , Durable Large Zipper. People In Daily Life Usually Need A MULTIFUNCTIONAL LARGE TRAVEL DUFFELS Or CARRYON LUGGAGE TOTE which Can Be Used in Traveling, Business Trips, Vacation or Daily Life, Our Product is The Perfect Travel Bag for You! 1. Classic And Retro Design,Traditional Manual Craft, Durable Nylon Thread Sewing,Strong Inside Linging. 2. Strong And Abrasion-Proof Bottom Studs For Protection Of The Bottom. 3. A Patch On Both Sides Prevents Zippers From Falling Open Completely And Provides Sides For Easy Packing. 4. Two Inside Open Pockets For Small Items ,Like Keys ,Wallet,Or Phone;One Inside Zipper Pockets Can Store Small Items Without Having Them Roll Around Inside The Large Compartment. 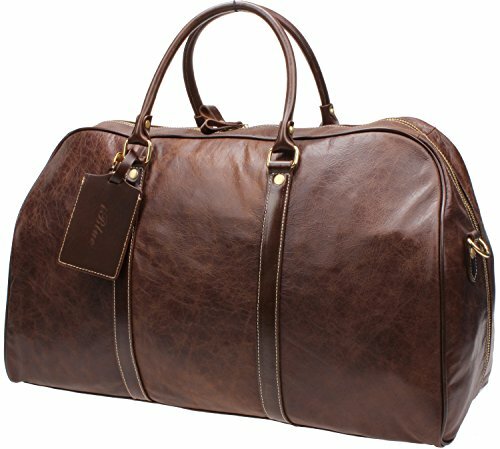 What Are Function Of The Leather Duffle Bag? It Would Also Work For A Carryon Garment Bag, Business Duffle Bag, Weekend Travel Bag, Large Overnight Bag,Gym Bag, Camping Bag, Luggage Tote Bag Or Any Bag You Need To Store Items In For The Day In Any Casual Use. If You Have Any Questions,Please Contact Us Via Email.Through The Order ,You Can Find Out : CONTACT SELLER . With The Difference In The Measurement Method, Please Allow 0.3-1.1 Inch In Size Deviation. ✔Quality Warranty- The Genuine Leather Weekend Bag Have 3-Year Warranty. ✔Material- Thick Genuine Leather , Large Double Zipper, Superior Quality Threads. ✔Perfect For 3-5 Days Trips- Fit Lots Of Travel Needs,Whether Clothing Articles,Towels,Toiletries And Electronics. ✔Dimension- 22 In L X 8 In W X 11 In H,Size Is Perfect For Daily Life Weekend Overnight Trip Or Carry On For Excesses Things To Bring Back. ✔Zipper Opens To The Bottom- Note That The Zipper Opens From The Top In Both Directions And Goes Down To The Base. If you have any questions about this product by iblue, contact us by completing and submitting the form below. If you are looking for a specif part number, please include it with your message.